Singapore - a so-called city/state is really a compact country. It sits at the east end of the Malacca Straits and all cruisers who have braved Indonesian waters pass it on the way to Thailand and points west. Check In Procedures - The following procedures apply in order to check into Singapore. At your earliest opportunity (within 8 hours if possible, 24 at the latest), take passports, zarpe (clearance papers from previous port) and ship's papers and proceed first to the Immigration Department, Seaman's Section. Immigration - Immigration Department Seaman's Section, 1 Maritime Square 03-01B World Trade Center Telock Blangah Rd. Singapore, 099253, Phone 273 0525. Port Clearance - Port Clearance Maritime & Port Authority of Singapore, Harbour & Pleasure Craft, One-Stop Document Centre, 7A Keppel Rd. #01-26, Tanjong Pagar Complex, Singapore 089054 Phone: 325-2371. Upon entry, obtain queue number and wait until number is displayed on monitor. Proceed to designated counter and fill out appropriate forms. How to get there: Take bus 10, 30 or 100 from the World Trade Centre and get off at the stop after the Railway Bus Stop. From here it's a walking distance to your left across the road. Or take a taxi from the World Trade Centre. The fare should be about $4.00-$5.00. Check Out Procedures - The following procedures apply in order to check out of Singapore. 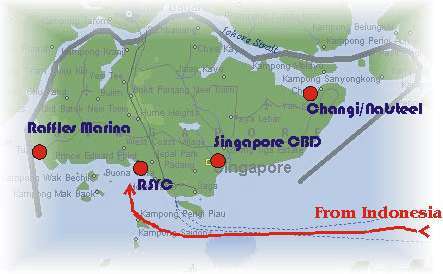 Go to Port Clearance (see address above) There is a port clearance fee of S$2.00/day or S$30.00/yr. for all boats.